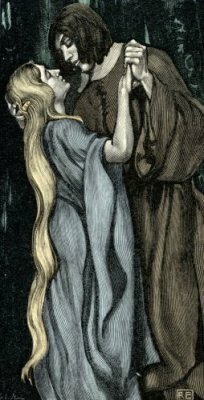 Tristan and Isolde are the principal characters of a famous medieval love-romance, based on a Celtic legend (itself based on an actual Pictish king). 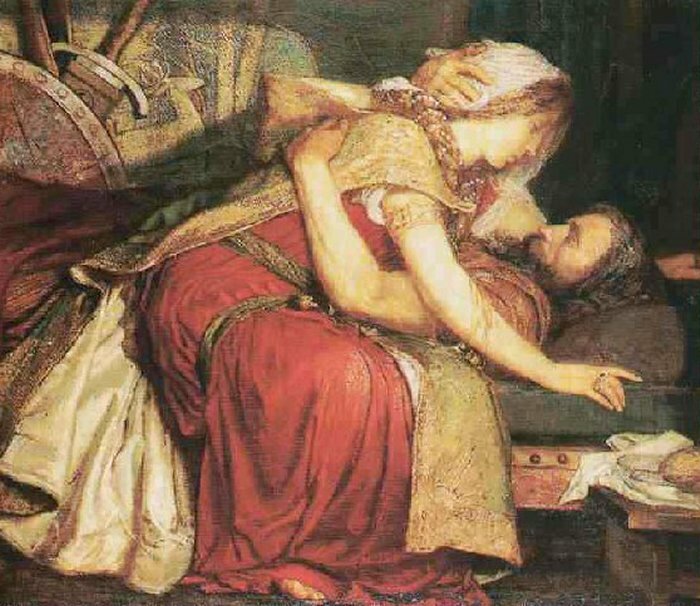 The love story of Tristan and Isolde is one of the most famous tragic stories in the western world. Like most legendary tales told over many centuries, there are several variations of the the tale; this synopsis is of Richard Wagner's magnificent 1865 opera, Tristan und Isolde. Wagner based his libretto on the 13th century romance by Gottfried von Strassburg. ACT I. The legend of Tristan and Isolde (Tristram and Iseult) takes place during the Middle Ages, when knighthood and the chivalric code prevailed. On board ship from Ireland to Cornwall, a sailor's voice resounds from the rigging. 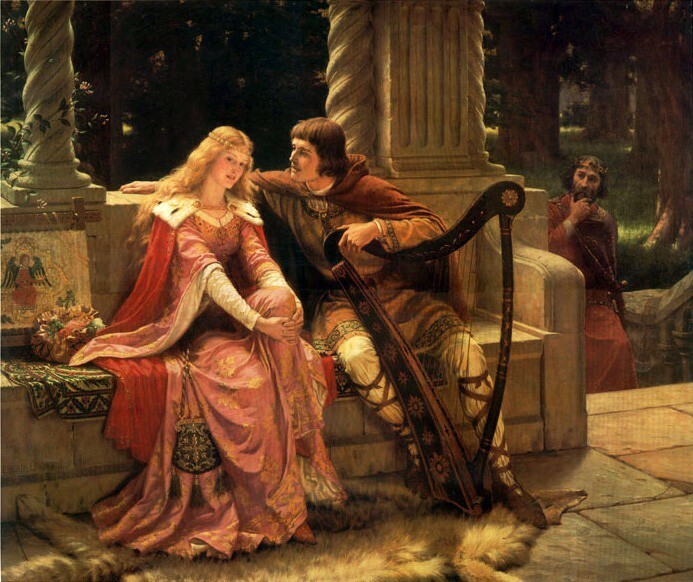 His song about an Irish girl annoys the fiery Isolde, who is being taken by Tristan as bride for his uncle, King Marke. Isolde wishes the ship would sink rather than take her to her hated destination. Her companion, Brangäne, tries in vain to calm her. Instead Isolde is enraged by the knight Tristan, whom she sees standing on the afterdeck, avoiding her: by delivering her to his uncle, he shows no regard for her feelings. She sends Brangäne to summon Tristan, who sends back courtly, evasive replies. His plainspoken companion, Kurwenal, however, tells Brangäne that Tristan is not a vassal to answer Isolde's beck and call. Embarrassed by this outburst, Tristan sends Kurwenal away, but not before the latter has intoned an insolent verse about Isolde's fiancé, Morold, whom Tristan killed in combat some time before. Sailors pick up the refrain as the crestfallen Brangäne returns to the furious Isolde, who recalls that after Tristan came to Ireland to collect taxes for King Marke and killed Morold, she herself nursed him back to health, using her mother's knowledge of herbs and magic. When she realized he was her fiancé's slayer, she bemoaned her charity — but when he looked lovingly into her eyes, she took pity on him. Now he delivers her like a chattel to his uncle. She hurls forth a curse on his head and wishes death for both of them. Brangäne tries to tell her that it is no dishonor to marry a king and that Tristan is simply performing his duty. Isolde replies darkly that it shows his lack of love for her. When Brangäne reminds Isolde that her mother charged her with secret arts, Isolde tells Brangäne to prepare one of her mother's potions — the one that brings death. Cries from the deck that land is in sight are followed by the arrival of Kurwenal, who bids the women prepare to disembark. Isolde retorts that she will not accompany Tristan until he apologizes to her for his offenses. 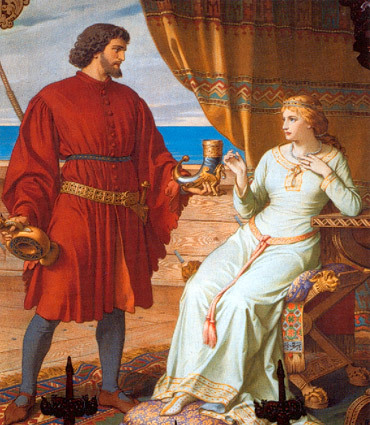 Kurwenal takes the message to his lord while Isolde forces Brangäne to pour the potion. Tristan appears, greeting Isolde with cool courtesy. When she announces that she wants satisfaction for Morold's death, Tristan offers her his sword, but she will not kill him. This would violate King Marke's hospitality and her own unwilling vows, she replies. Better that she and Tristan make peace with a drink of friendship. Understanding that she means to poison them both, he drinks, and she does the same. Expecting death, they exchange a long look of love instead, then fall into a passionate embrace. Brangäne admits she mixed a love potion as sailors' voices hail the ship's arrival in Cornwall. ACT II. In a garden outside Marke's castle, distant horns signal the departure of the king and his retinue on a hunting party. Impatient for a rendezvous with Tristan, Isolde believes that the party is far off, but Brangäne cautions her about spies, particularly Melot, a jealous knight whom she has noticed watching Tristan. Isolde says Melot is Tristan's friend and urges Brangäne to put out the warning torch so that Tristan can approach. Brangäne knows this would be unwise, but when she laments having switched the potions, Isolde tells her the power of love rules all destiny and guided her hand. Sending the girl to stand watch, Isolde herself puts out the torch and welcomes Tristan rapturously. Both hail the darkness, which banishes the light of everyday reality and false appearances. It was the forces of daylight, Isolde says, that caused Tristan to behave conventionally and bring her from Ireland; the potion, the power of love, has released them from this delusion. Feeling safe in the truthfulness of night, they welcome its embrace. Brangäne's distant voice warns that night will soon fade and danger be revealed, but the lovers equate their oblivion with death, which will give them the total union and safe removal they crave. Their idyll is shattered as Kurwenal runs in with a warning: the king and his followers have returned, led by Melot, who denounces the lovers. Moved and disturbed, Marke declares that it was Tristan himself who urged him to marry and chose the bride, asking how a knight he so loved could bring dishonor on him. Tristan says he cannot answer, then turns to Isolde and asks whether she will follow him into the realm of death. She accepts, and Melot rushes forward, sword drawn. Wounded, Tristan falls in Kurwenal's arms. ACT III. Outside Kareol, Tristan's home castle in Brittany, the knight lies grievously wounded, tended by Kurwenal. To a Shepherd who inquires about his master, Kurwenal replies sadly that only Isolde's arrival, with her magic arts, can save him. The Shepherd agrees to change the sad tune he is playing on his pipe as soon as he sights a ship approaching. Stirring, Tristan asks where he is, then in delirium says he has visited the realm of night and will return there. He clings to life only so that he can find Isolde and take her with him. Tristan thanks Kurwenal for his devotion, then imagines he sees Isolde's ship approaching. But the Shepherd still pipes a sad tune: the sea is empty. Tristan recalls the tune, which he heard as a child in connection with his parents' death and which he later associated with his own near-death after the duel with Morold. He wishes Isolde's medicine had given him peace then instead of reviving him to suffer the torments of longing. Once more he swoons, then revives to imagine Isolde's smile as she draws near. The Shepherd's tune finally changes to a cheerful fanfare, and Kurwenal sees the ship. Tristan rouses himself in growing agitation. For once he blesses the day, because it lights Isolde's way to him. Recklessly he tears off his bandages, letting his wounds bleed so that she can heal them — "forever." 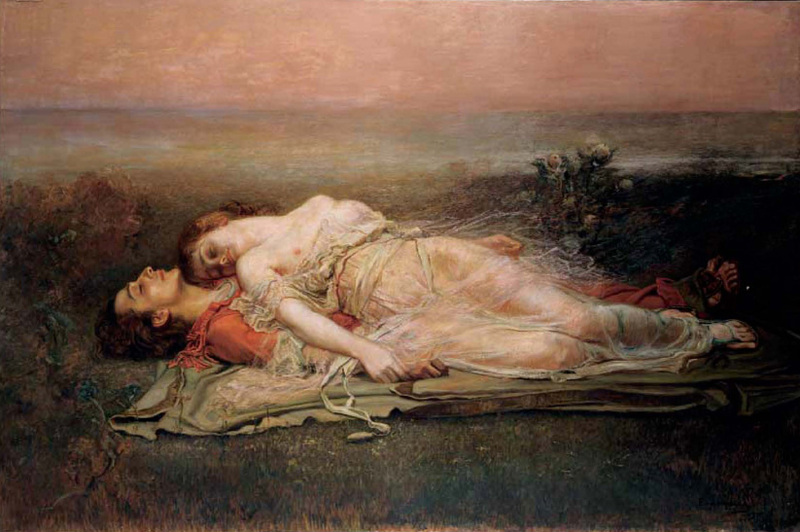 No sooner has Isolde rushed in than he falls dying in her arms. She exhorts him to live in order that they can share a final hour of reunion, but he is dead. The Shepherd sights another ship, which Kurwenal assumes is bringing Marke and Melot, bent on vengeance. Though Brangäne is with them, Kurwenal will not listen and attacks them, killing Melot and holding Marke's retainers at bay until he himself falls, mortally wounded. Marke, overwhelmed with sadness, sees the dead Tristan, while Brangäne tries to arouse Isolde, telling her the king has come to pardon and unite the lovers. But Isolde, oblivious, has a vision of Tristan beckoning to the world beyond. Must she alone perceive this and go to meet him? She must. As Brangäne tries to hold her, she sinks, transfigured in death, upon Tristan's body.